Adam Osborne was an entrepreneur most famously known for the first portable computer, but he also was an author who made a successful move into publishing computer books and software. Osborne was born in Thailand on March 6, 1939, to British parents and spent most of his childhood in India. He attended school and graduated from Birmingham University in 1961, later receiving his Ph.D. from the University of Delaware. He began his career as a chemical engineer working for Shell Oil, then left in the early 1970s to pursue an interest in computers and technical writing. He founded Osborne Publishing in 1972, specializing in easy-to-follow computer manuals. His first and perhaps most influential book was "An Introduction to Microcomputers." Reportedly, some of the earliest work of Bill Gates and Paul Allen drew heavily from this manual. Rejected by other publishers, the book ultimately sold 300,000 copies and was the backbone of Osborne Publishing. By 1977, Osborne Publishing had more than 40 titles in its catalog, and in 1979, Osborne sold the company to McGraw-Hill for a rumored $3 million, using the money to launch the Osborne Computer Corporation. In 1981, he introduced the first portable computer, called the Osborne 1. It weighed about 23 pounds, could fit underneath an airplane seat, and cost $1,795, or approximately half the cost of computers from other manufacturers with comparable features. 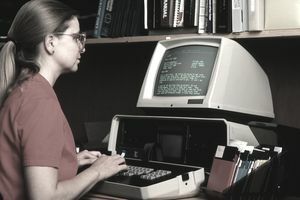 The computer ran the CP/M operating system—a popular standard before the introduction of MS-DOS—and featured a full keyboard and 5-inch, built-in monochrome monitor. The company shipped more than 10,000 computers per month, and it was considered a huge success, earning $6 million in 1981 and $68 million the next year. One contributing factor to Osborne Computers' collapse was when Osborne bragged to the news media about two advanced computers the corporation was working on. Sales of the Osborne 1 reportedly dried up as customers held out for the new machines. The result was inventory glut, and the company was forced to file for bankruptcy. Competition from IBM and others in the growing personal computer industry also contributed to Osborne Computer's struggles. After the fall of his computer company, Osborne wrote and published several bestselling books about his experience, including "Hypergrowth: The Rise and Fall of Osborne Computer Corporation." In 1984, Osborne founded Paperback Software International, which specialized in inexpensive computer software. The company's ads featured Osborne himself arguing that if telephone companies applied the same logic to their pricing as software companies, a telephone would cost $600. Lotus Corporation sued Paperback in 1987, arguing that one of Paperback's programs infringed on the Lotus 1-2-3 program. This drove consumer and investor confidence spiraling downward for Paperback, and Lotus won the suit in 1990. Osborne stepped down from the company shortly thereafter. In 1992, Osborne returned to his home in India after suffering from multiple strokes caused by an incurable brain disorder. He died at age 64 in 2003 in relative obscurity in Kodaikanal, India.